Pixi by Petra Brow Tamer | $10 | This full size brow gel is infused with aloe to help condition brows as it keeps them in place. This is a great finishing touch for natural brows or in conjunction with your favorite brow product. Doucce Freematic Blush Mono in Pink Beach | $14 | This blush completes the duo compact that was included in last month's box. There were two color possibilities and I love this fresh pink I received for a natural flush in any season. Lancome Monsieur Big Mascara | Sample, Full Size $25 | This long-wearing mascara provides volume and bold color to your lashes so there's no need for falsies. I love getting mascara samples for travel and trying out before I decide to purchase. I may save this one if I bring a mascara in my hospital bag. Doctor Babor Hydro Gel Eye Pads | Sample, Full Size $29 | I'm all about cooling under eye products lately! My exhaustion is slowly returning so I love reviving my complexion with soothing, hydrating products. These gel pads are easy to use and only need to be on 10-15 minutes. Bliss Fabulous Foaming Face Wash | Sample, Full Size $24 | I love a multi-tasker and this face wash is just that. It removes makeup, hydrates and soothes all in one step. Key ingredients include rose hip extract, milk thistle and chamomile. 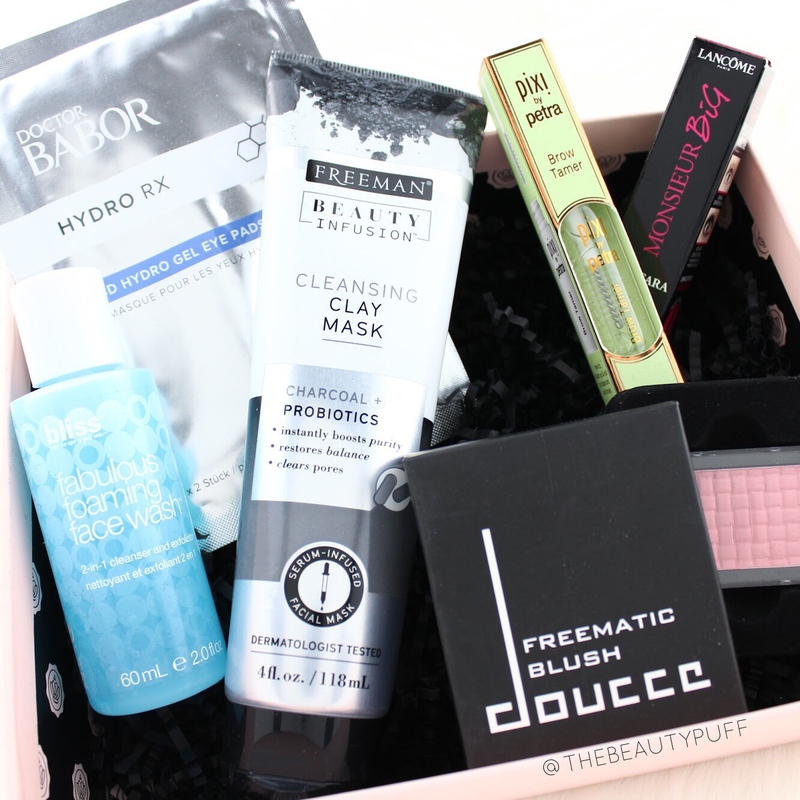 Bonus Product Freeman Charcoal Cleansing Clay Mask | I actually have this mask and love it! It's great for oily skin and doesn't take long to draw dirt and toxins out of the pores. A great mid-week refresher when you're low on time. Monthly subscriptions to Glossybox are $21/mo with discounted rates for 3, 6 and 12 month plans. Subscribe this month and receive a free topcoat with code PINKGEL. Subscribe below!